The Mercure Sapporo enjoys a location in the popular entertainment district of Susukino, renowned for its many bars and restaurants. Offering easy access to the Sapporo ski resorts and attractions such as the Clock Tower and Sapporo TV Tower, this hotel has it all, including a shopping mall within the building. 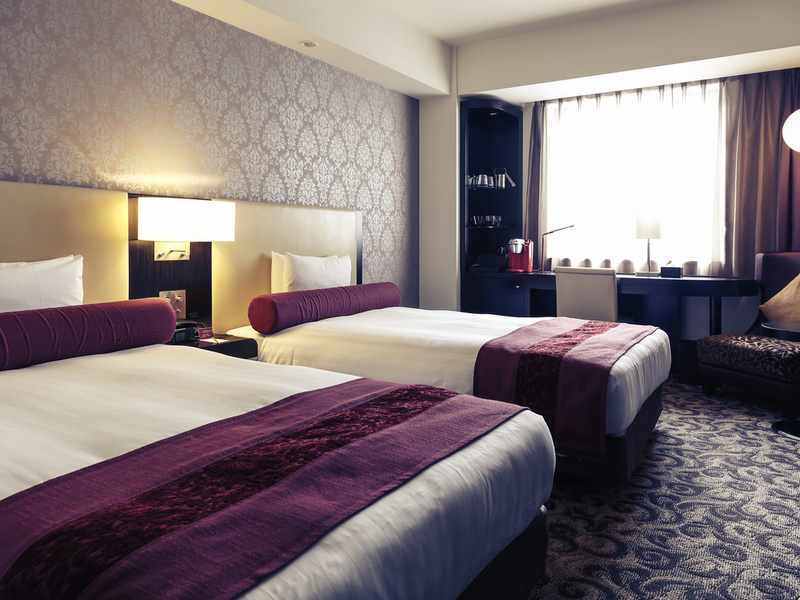 Featuring 285 rooms equipped with complimentary Internet access, plus a French restaurant and conferencing facilities, the Mercure Hotel Sapporo is ideal for both business and leisure. Located in Sapporo, Hokkaido- Fifth largest city in Japan by population - Famous for its cuisine, such as Miso Ramen, Seafood, and Jingiskan.- Point of interest, such as TV Tower, Tokei-dai, and Beer Museum Sapporo is Japan's fifth-largest city and arguably the most beautiful. With its picture-postcard landscape and vibrant downtown precinct, Sapporo is booming with holidaymakers, honeymooners, weekenders and business travellers. In central Sapporo with easy access to Susukino and shopping areas. Bordeaux Restaurant offers delicious French dishes at an affordable price. Try our sumptuous buffet on Friday or Saturday night and discover quality produce prepared by our dedicated team. The Le Cepage bar invites you to relax in French style with a select range of wines and cocktails. Room is comfortable Location is convenient Convenient store is near by Staffs are friendly and good in English If I have chance back to Hokkaido again, I’m sure I will choose Mercure hotel Sapporo! Location, cleanliness and staffs are excellent. Warm welcome, nice service and good location. Warm welcome and nice service. Our rooms are ready a little bit before standard check in time so we can check in early. Check in and check out are both easy and fast. Le club member feels special with thanks for welcome drink and some amenities. Free shuttle bus service between the hotel and the JR Sapporo station is good. Handyphone is useful. Breakfast is good and enough but maybe there are only 2 sets of food switching, doesn't have any noodles or ramen, same salad, same fruit and same bread every day. The hotel is very near to the shopping street. The room was nice and comfortable. The front desk was very helpful. The location of the hotel is good, many restaurants around,the room is spacious for a family considering you’re in japan.the only small improvement needed would be the variety of breakfast, it’s the same everyday. Clean, love the amenities and service. Wanted a little more American tv stations. It was convenient, service was good, rooms were dated with a tight bathroom. The darker furnishings made the room feel smaller. Room wasn't available when we arrived earlier, however the front desk held our luggage until check in which was nice. Very positive. Staff was extremely helpful. Breakfast food was delicious! The hotel is close to everything with a decent size of beds. Buffet breakfast has a wide variety of choices. The stay was great overall. The only thing was the lead pencil in the room wasn't working. There's no lead left. Would be nice to have a pen in the room for guests to write notes. Location, Room condition, staff, and everything was perfect! Front desk staff I met were so kind and helpful. specially thank you for the person who informed about limousine bus. Room was great with nice view. Thank you so much. Staff were very helpful and friendly. Liked the breakfast menu. Hotel facilities were really nice. Thanks for a lovely stay! Guest Service, room cleanliness, location, value, this hotel had it all. We look forward to returning. Stopping over in Sapporo on our way to Honshu.